Off-grid solar power vs grid-connected solar power: what will be the road ahead? Electricity customers using solar power plus batteries will increasingly be able to choose whether they want to maintain grid connection or go off-grid. In a new report, the Rocky Mountain Institute (RMI) predicts that most customers will not defect from the grid. Nevertheless, grid use will be drastically reduced. Utilities will need to develop new business models and “innovative thinking” to cope with this new reality. The report focuses on the US but has important implications for Europe as well. Rising on the horizon of a new solar energy era, concerns for stranded assets are keeping power company stakeholders up at night. Equally disconcerting, low- and fixed-income electricity consumers with no financial ability to upgrade to solar will find themselves unable to handle higher utility bills as electricity prices increase, due to increased grid-defection. Only with an informed roadmap of the economic implications of America’s rising love affair with solar energy, can we navigate a socially just and economically viable way forward. The Economics of Load Defection, a new report released on 7 April by Rocky Mountain Institute (RMI), offers this roadmap. Noting that retail prices for grid electricity are climbing while costs for solar PV and batteries are declining, The Economics of Load Defection projects the coming electricity load and revenue loss that utilities could well face in the coming 10-15 years. Implications for utility companies and regulators are clearly detailed in the new report, as well as possible paths forward. Solar-plus-battery systems are expected to play a major role in America’s future electricity grid. But exactly what that role will be is not yet clear. Retail pricing structures, utility business models, and regulatory frameworks are all evolving at a steady pace, and outcomes of these evolutionary processes will largely determine which trajectory the grid will follow into the rising solar energy era. “Net energy metering is a contentious yet prevalent policy that has successfully supported distributed solar PV’s growth in the U.S. Some argue that it hastens load loss from the grid (net-metered solar PV customers quickly reach effectively zero net grid purchases) and that abolishing net metering will preserve grid load. While implications from the above findings could be very large, the report also recognizes emerging opportunities. 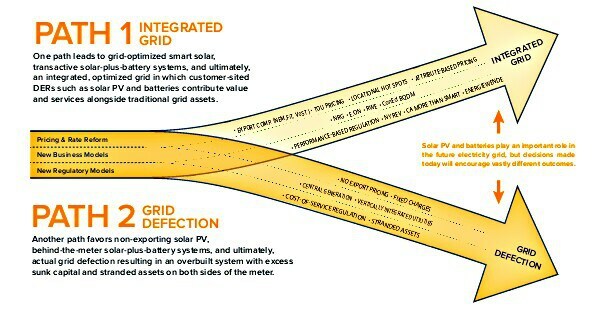 Although grid-connected customers are projected to represent significant electricity load loss, the customers’ grid-connected solar-plus-battery systems “can potentially provide benefits, services, and values back to the grid, especially if those value flows are monetized with new rate structures, business models, and regulatory frameworks.” Crucially, grid-connected customers are projected to maintain their connection to the grid, as long as grid defection isn’t encouraged by penalizing charges and/or changes to retail electricity price rate structures. For customers that invest in solar PV and solar-plus-battery systems, the emergence of choice is good news. Report analysis suggests that, “with smart solar-plus-battery investments, customers could see peak pricing emerge, insulating themselves from rising prices for grid-supplied electricity.” However, traditional grid-supplied customers would see higher pricing from rising retail prices, and defected customers (off-grid) would face the necessity of larger, more expensive stand-alone solar-plus-battery systems. For owners and operators of central generation and transmission (such as independent power producers and merchant power plants), report findings are likely bad news. The report analysis predicts that the decline of sales from central generation will accelerate with the adoption of solar-plus-battery systems, and the risk of stranded assets is real. As noted in the report, “Existing assets still within their economic life and cost recovery period will serve a smaller and smaller remaining load, requiring price increases to cover costs and returns. Meanwhile, assets in the planning pipeline won’t see the future demand to justify their capacity and generation output.” Reductions in peak price spikes are also likely in deregulated markets, and solar-plus-battery systems are additionally expected to encroach on markets for ancillary services. For distribution grid operators (such as wires-only utilities), the emergence of distributed solar PVand batteries is good news. Distribution grid customers with solar and battery systems are anticipated to provide value to the grid including upgrade deferrals, congestion relief, and ancillary services. However, the report notes that in order to fully capitalize on these opportunities, new business models, pricing schedules, and regulatory reforms need to evolve. For vertically integrated utilities, these systems will strain current business models, and adjustments will be necessary. New business models are needed to fully capitalize on the rising adoption of solar PV and batteries. The report authors anticipate that similar challenges will be faced by distribution utilities whose revenue depends on volumetric sales of electricity. Jules Kortenhorst, CEO of Rocky Mountain Institute and Carbon War Room notes, “Today’s electricity system is at a metaphorical fork in the road. Down one path are pricing structures, business models and regulatory environments that favor eventual grid defection.” This path leads to the inevitable stranding of grid assets serving a dwindling load. On the other hand, “down another road, those same factors are appropriately valued as part of a transactive grid with lower system-wide costs and the foundation of a reliable, resilient, affordable and low-carbon grid of the future in which customers are empowered with choice”, says Kortenhorst. This alternative path favors business models, regulatory reforms, and stable price structures in which, as the report authors suggest, “distributed energy resources [DERs] such as solar PV and batteries – and their inherent benefits and costs – are appropriately valued as part of an integrated grid.” Such an integrated grid offers a future, according to the report, where grid and customer-side resources collaborate with far greater efficiency in the generation and usage of both capital and physical assets. These two pathways into the rising solar energy era are not set in stone. There is ample room for innovative thinking, entrepreneurial planning, and socially just strategies. However, the decisions being made today are likely to set us on a course that becomes more and more difficult to correct. The time frame for optimizing the future grid is relatively short, and growing shorter and more urgent for some geographical regions where solar options are already prevalent and appealing. 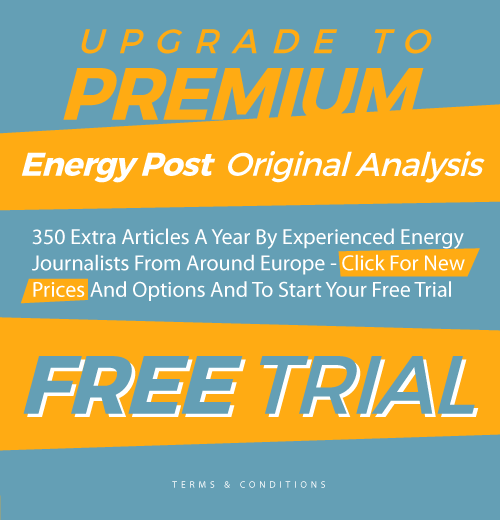 This article was first published by Solarlove.org on 7 April and is republished here with permission and under licence from the publisher. Aisha Abdelhamid is a former Computer Engineer with the U.S. Dept. of Defense who resides in Egypt. She also writes for InspiredEconomist.com and Planetsave.com.